This is one of the rare recipes I didn’t tweak the first time I made it. After all, who is going to mess with Paula Dean?? Not this little chickadee! I followed the recipe exactly. She said it yielded 60 blossoms but I came up with exactly 48. The yield may depend on the size of your tart/mini muffin pans. I used a teaspoon to fill each cup half full so when the cake rise they don’t come over the top of the cup. The batter is quite thick. Be sure to generously spray the muffin tins. Or you could find yourself washing stuck on muffins out of them so you can do the next batch – just sayin’. Of course if you own pans that will let you make four dozen at once, just disregard – or better not. Everything comes out better with generosity. One batch was cool when I dipped it into the glaze (thanks insurance company for your fourth call on the same issue. Please look at all the records before you call! Whew – all better now.). The second batch was right out of the oven – didn’t seem to make a difference. Or at least not as much as I expected because I thought the warm cakes would absorb more glaze. I tried several different way of glazing. The one that worked best for me was to put the cake in the bowl of glaze and spoon the glaze over it, then transfer to a fork in my left hand. I held the dripping cake over the broad bowl of glaze while I put in a second cake and repeated the process with my right hand. When the second cake was glazed, the left hand cake had stopped dripping and I transferred it to the rack with the finger of my right hand. Put the second cake on the fork and continue with the process until all were done. I ended up with about a fourth cup of glaze (probably for the last dozen I didn’t have) left over so I drizzled it over the top of all the cakes. 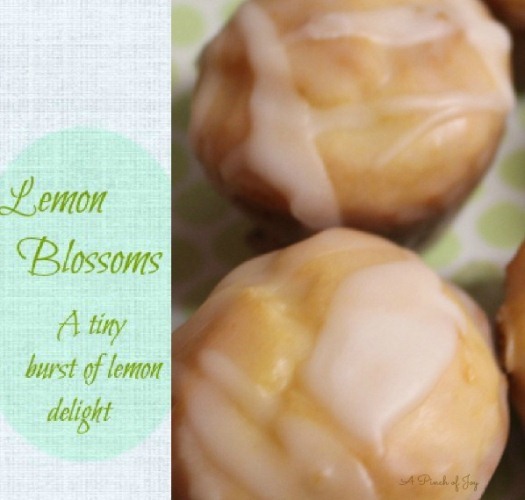 A lemony treat just the right size to satisfy your sweet tooth. Perfect for a tea party, buffet table . . . or Easter dinner. 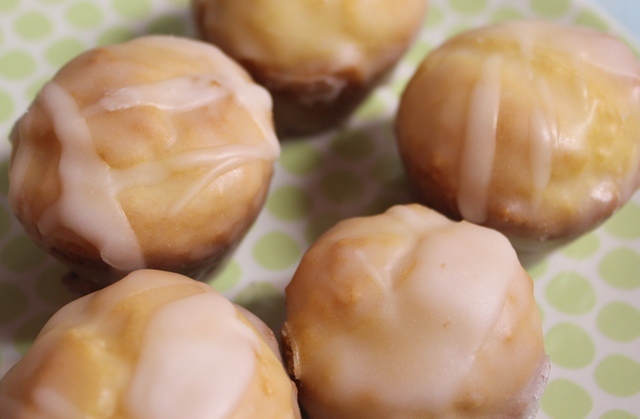 A sweet lemony cakelet with lemon glaze -- a delicious two bite dessert! 1 instant lemon flavored pudding mix, 3.4 oz. Spray miniature muffin or tart pans with nonstick cooking spray. In a large bowl, combine cake mix, pudding mix, eggs, and ¾ cup oil and beat for 2 minutes. Batter will be very thick. Spoon batter into each muffin cup using a teaspoon to fill them no more than half full. Bake for 12 minutes until just turning golden. Turn cakes out of the pan while warm. Add lemon zest, lemon juice, oil, and water, stirring until smooth. Dip the cakes into the glaze while warm, taking care to thoroughly cover each cake. Place the cakes on a wire rack with wax paper underneath to catch the drips. Let glaze set firmly before storing in an airtight container. I’m so glad you stopped by today! Be sure to follow A Pinch of Joy so you don’t miss a thing! I’d love to have your company on this venture!! Subscribe by email on the sidebar or follow on Facebook / RSS feed / bloglovin’ / twitter and check out my pinterest boards. If you found this helpful or inspiring please share below! Your support of A Pinch of Joy is appreciated! These are going to be on my Easter brunch menu! They look heavenly! These sound fabulous. I love citrus and anything sweet!